Image Size: 90"w x 23"h.
A remarkable work of art available in a series of uncommon fine art sizes up to nearly 8-feet wide! Relieve the glory days of railroad travel with Tucker Smith’s grand panorama "The Great Northern." Streaming through scenic Glacier National Park in northwest Montana, this locomotive boldly crosses a narrow trestle high above historic Two Medicine River. This is how the Great Northern would have looked on a fine summer day in the late 1930s, the white-capped Rocky Mountains keeping their snow all year. Tucker Smith’s grand panorama of railroad travel’s glory days brings us to the eastern doorstep of Glacier National Park. The magnitude of Smith’s original landscape painting is present in these incomparable Museum and MasterWork™ Edition Canvases! Choose from 90", 72" or 60" wide! 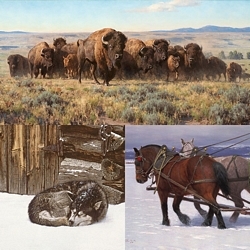 Tucker Smith’s "The Great Northern" is an extraordinary work of art for an extraordinary room.